Just days after McDonald’s began stuffing kid-friendly fitness trackers in its Happy Meal boxes, the fast food giant has removed the devices from the menu — not over claims of pointless “health washing,” but because some kids complained the trackers were causing skin irritation. The company didn’t specify how many reports it received or if it would recall the trackers, as it did with 2.3 million Hello Kitty whistles after two children coughed up pieces. McDonald’s recently began offering the “step-it” trackers in six colors for a limited-time in Happy Meals sold in the U.S. and Canada. The company said the devices were part of a promotional campaign aimed at getting kids on the move. The trackers count steps and light up based on how quickly or slowly the wearer is moving. 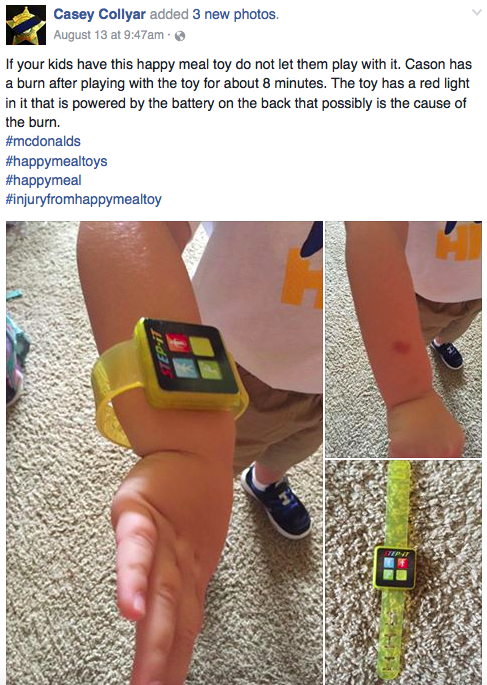 An Arkansas woman notified McDonald’s last week that her four-year-old son appeared to have been left with a burn mark after wearing the device, CNN reports. After posting about the issue on Facebook, the woman says she received nearly a dozen messages from other parents who said their children experienced the same irritations. Other parents have shared information about the irritations on McDonald’s Facebook page.